Keep your important documents and keepsakes safe from fire! 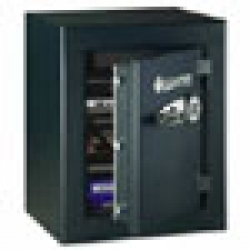 The Sentry Fire Safe offers a variety of interior organizational features that allow you to customize the interior for storage of business documents and other items. Contents remains safe up to 1400 degrees Fahrenheit for 30 minutes, interior temperature remains below 350 degrees Fahrenheit. ETL certified to manufacturer's fire protection specifications.